MYANMAR: Only $211 per pax for 4D3N Stay at Hotel Grand United or New Yangon Hotel + 2-way Transfers + Half Day City Tour + Daily Breakfast. Min 2 to go. Please ensure passport is valid for at least 6 months from travel period. .
1 voucher is valid for 1 pax. Min 2 pax to travel and must travel together. Rooms are based on twin sharing. Luggage allowance for each passenger is one large bag and one hand-carry bag. If extra luggage which can’t fit in vehicle, you will have to cover any additional costs incurred in transferring the extra luggage. Once bookings are confirmed, strictly NO amendment or refund can be made. 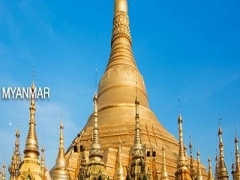 Explore the colonial charm of Myanmar's biggest city, YANGON with today's StreetDeal and be dazzled by this city that is steep in its appreciation for nature and religion. Known as the Garden City of the East, YANGON is home to stunning lakes, parks and lush tropical greenery that is the backdrop to a melting pot of diverse cultures. Explore this exotic city formerly known as Rangoon that balances tradition and culture with modernity!